In 2015, The Farmers’ Museum acquired all of the negatives and photographs by Charles Winters taken for his book with Jean Simonelli, TOO WET TO PLOW. The book documents the story of farmers’ lives through a compilation of stories and Charlie’s memorable photo-documentation. Intimate portraits of men and women who worked together to keep a farm running, and children who helped on the farm, were shown in black and white and vivid color. For some children, the farm was a playground of sorts, for others it was a means to learn about animals, the earth and growing food, or hard work. They saw their parents put in time, twenty-four/seven. A life of work; a life without long vacations and with little break. 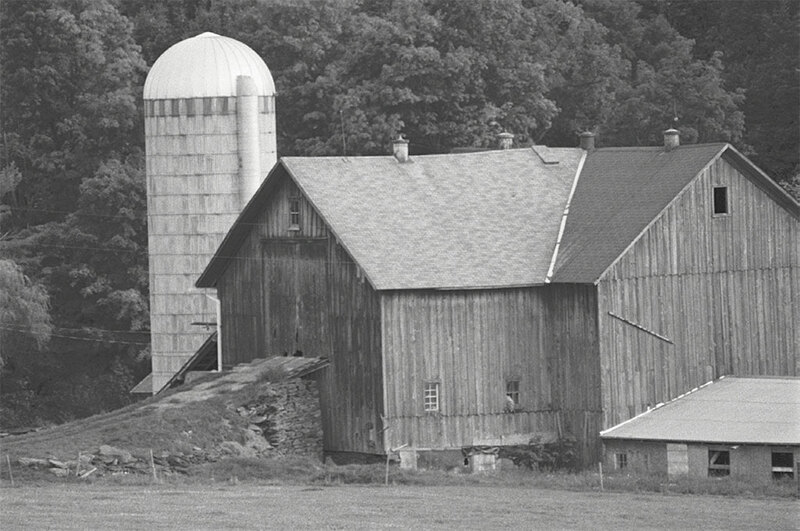 View of Field with Barn, 1986, Charles Winters, film negative. The Farmers’ Museum, Cooperstown, New York, Museum Purchase, F0002.2016(067)d.2. 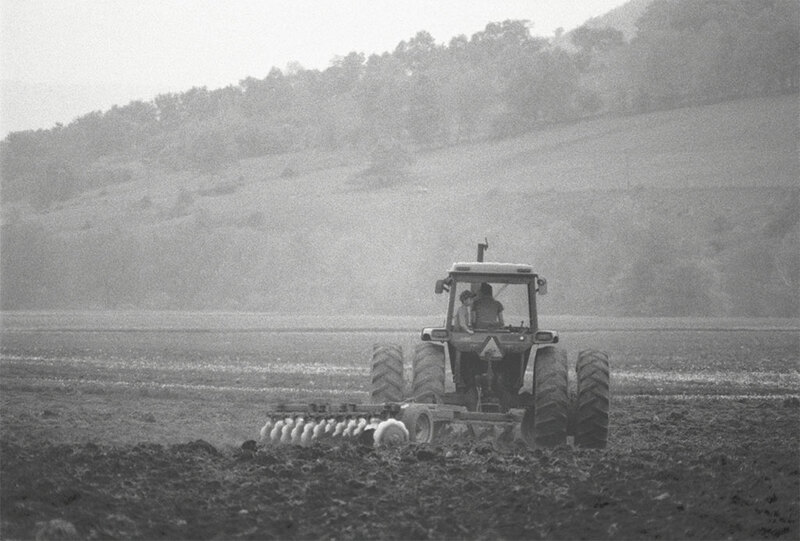 Discing the Field, 1987, Charles Winters, film negative. The Farmers’ Museum, Cooperstown, New York, Museum Purchase, F0002.2016(045)c.1. Farm in Delaware County, ca. 1986-1987, Charles Winters, film negative. The Farmers’ Museum, Cooperstown, New York, Museum Purchase, F0002.2016(069)e.5. The mid-1980s saw one of the greatest farm crises in the United States, when government involvement seemed necessary to keep the industry alive. 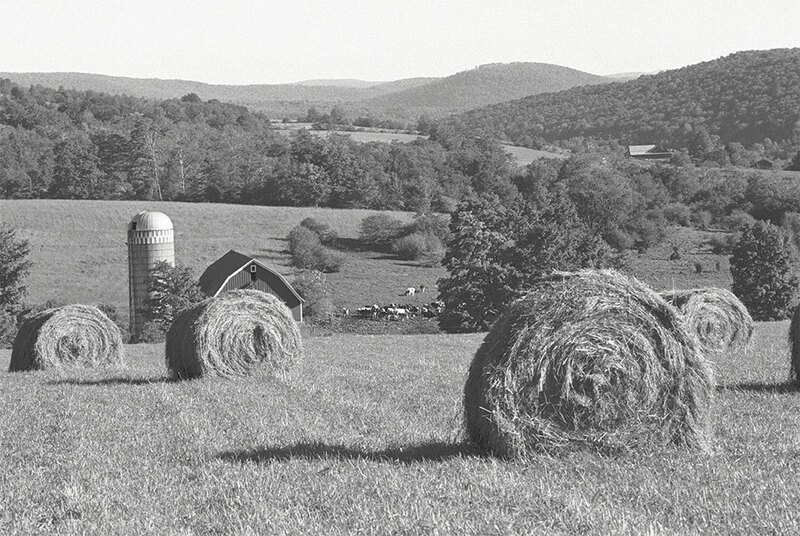 Simonelli and Winters, both SUNY Oneonta professors, embarked on more than a year of late nights, early mornings and weekend jaunts to the hills and valleys of Delaware and Otsego Counties to document the small farming communities of upstate New York. They met many a farmer. From young couples just starting out, to seasoned pairs, to children taking over after several generations. Life may have appeared bucolic at times, but it was dirt and grit. Long summers in fields of hay and corn; long winters keeping animals fed hauling grain, hay and silage; keeping cows milked, entryways and buildings plowed out. Winter was only a slight break from the weary, well-worn days of summer work. Spring brought new life in the way of nature, whether in the form of new crops or new calves born that would later succeed their mothers in keeping the herd going. At the turn of the summer season, autumn brought with it the bounty and harvest that was the reward of hours of hard work put in during the spring and summer. As part of this collecting initiative, The Farmers’ Museum is asking for your help in identifying some of the people, families and farms recorded in 1986 and 1987 for TOO WET TO PLOW. In the collection are portraits of folks that we hope to identify and learn more about, as well as farms that we would like to identify. If you are from any of the following towns or hamlets: Treadwell, Bloomville, Delhi, Masonville, Meridale, Delancey, Davenport, Stamford, Jefferson, Coventry, Milford, Oneonta, Cherry Valley, Laurens or others, please contact us if you are interested in helping out! If you, a family member, or someone you know was involved in the making of this book, please contact Christina Milliman, Curator of Photography at c.milliman@Farmersmuseum.org or (607) 547-1442. We look forward to hearing about you, your family, friends or neighbors and learning the stories of the last thirty years of folks involved in this great book and project! To see more of Winters’ photographs and others in the Plowline collection, visit plowline.farmersmuseum.org. Christina Milliman is Curator of Photography, The Farmers’ Museum and Fenimore Art Museum.